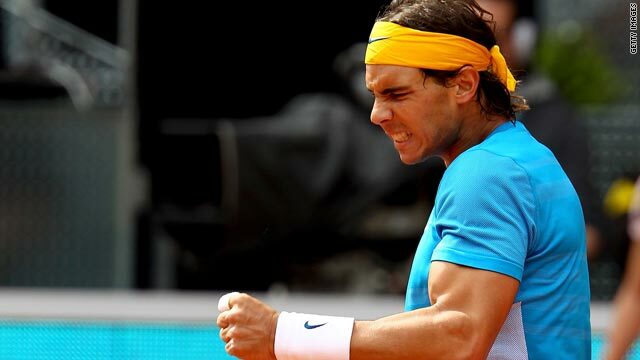 Rafael Nadal celebrates his straight sets victory over Gael Monfils at the Madrid Masters. (CNN) -- Rafael Nadal and Roger Federer are both through to the last four of the Madrid Masters, although they enjoyed vastly differing victories on Friday. Second seed Nadal defeated Gael Monflis in straight sets, to book his place against compatriot Nicolas Almagro. Nadal outclassed Frenchman Monfils 6-1 6-3 in just 79 minutes and remains on course to regain his world number two ranking next week after a stunning start to his clay-court season. The Spaniard is aiming for his third consecutive clay-court title this year and record 18th ATP Masters success of his career. Earlier in the day, Almagro needed under an hour to dispose of Austria's Jurgen Melzer 6-3 6-1, to reach his first-ever masters tournament semifinal. Meanwhile, Federer clinched a revenge win over Latvian Ernests Gulbis, who beat the Swiss maestro in Rome three weeks ago. Defending champion and top seed Federer fought back to win 3-6 6-1 6-4 and will face either Andy Murray or David Ferrer for a place in Sunday's final. "I knew it would be a tough match after losing to him in Rome," Federer told reporters. "I was always a bit worried. I got off to a slow start in the first set and paid the price. In the second I recovered and won six games in a row and got on a roll."